I've seen a number of articles about how NFL home field advantage has been very strong in terms of home and visitor scores. The thinking is that the replacement refs may be more influenced by home crowds than their more experienced predecessors. While I can't rule out that possibility, I can say it's premature to definitively say one way or another. In week 1 the average HFA was 3.2 net points, and in week 2 it was 8.7 net points. As I write, Week 3's average is -1.9 net points through 14 games. Week 1 was obviously well within the long term trend of 2.5 net points for the home team, and Week 3 tilted slightly toward the visitors. But week 2 showed a large advantage for home teams. We know there is week-to-week variance in net scores for home teams, but how far from ordinary is 8.7 net points for the home team in a single week? Since 2000 the standard deviation for weekly average HFA is 4.0 points, and the average is 2.4 points, which means week 2's 8.7 is not 2 standard deviations from the mean (p=0.40). Week 2 featured only the 15th largest HFA in the past 12+ years. The regular refs were on the field for the 14 weeks with larger HFAs. 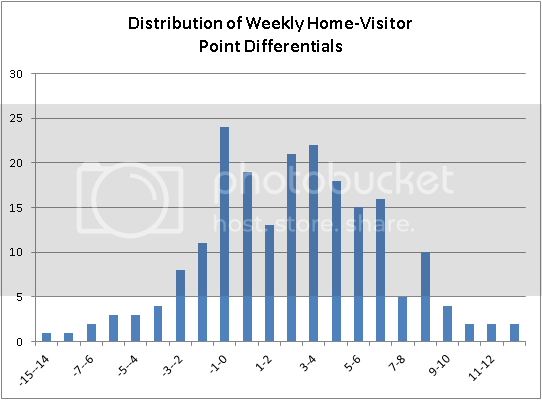 The chart below shows the distribution of weekly average HFA in net points for the home team. This is not to say that the replacement refs are not influenced by home crowds or that they're doing a good or bad job. It's just that we can't tell by looking at net point HFA. The source of HFA is mysterious. Research into crowd effects, officiating bias, and travel are inconclusive. There are sports which travel is not a factor that have HFA, and there are sports that generally have no crowd that also have a HFA. I have my own theory about where much of HFA comes from, but that's not to say that other factors don't enhance or mitigate it. Regardless of the cause of HFA, we'll need a lot more than a few weeks of games to be confident that the replacement refs are affecting it. The most obvious example of home field advantage is the noise level for home offenses vs. away offenses. Announcers will pump up the crowd leading up to big third down attempts by the visiting team, making it harder for the QB to communicate with his team. This is especially disruptive to QBs like Peyton Manning who call a lot of plays at the line of scrimmage and use audibles a lot. I've witnessed several occasions where crowd noise led to a false start, delay of game, or a timeout by the visiting team. At the same time, they will display things on the screens asking people to be quiet when the home offense is on the field, making it that much easier for the players to communicate with each other. I don't know if the noise level has the greatest effect on HFA. It probably doesn't, but unlike the officiating hypothesis, it's actually observable. This is a nice piece of analysis, but I think a better method, if difficult, would be to consider the vegas line the mean for each game, and work from there rather than from zero for each game. But the way things are going now, it certainly seems like the refs should be influenced to call things in favor of the home team. I'd guess they aren't feeling too safe out there. Re: using vegas lines, they'll already have HFA calculated in, or at least bettors impressions of HFA. That is to say, if you took every vegas line from every game for several years, the vegas line would be somewhere in the vicinity of 2.5 points in favor of the home team. And it's a fairly noisy thing to measure... Over the course of a season and ignoring 1982, HFA has been anywhere from 0.85 points (2006) to 4.6 points (1985). Now if you were attempting to calculate HFA by team, then using some measurement of strength rather than zero would make more sense. I've done so using SRS since 2002, and get numbers from +0.23 (Panthers) to +5.07 (Cardinals). In fact, the NFC West teams take 4 of the top 5 strongest HFA numbers. Because of the way SRS is set up, they'd take the exact opposite positions in away games, with the NFC West being the worst road teams. My point, Mattie, was that the Vegas line is the best known estimator of the point spread, and so if hfa was larger than it usually is then that would show up as a bias when measuring against the spread. Once again I will state that this would be the most accurate way of doing this. The Vegas line includes line setters and bettors impressions of the refs. As Brian already wrote once this week, if you want something valid, your dependent variable can't be determined by independent variables. I disagree that research on referee bias in inconclusive. In the book Scorecasting, they found ample evidence that referees are a source of home field advantage. This evidence ranges from how NFL win percentage for home teams dropped after instant replay was being used to bias in balls and strikes called in baseball from Pitch f/x data. I certainly don't believe that the refs are the only cause; but they are certainly one cause. 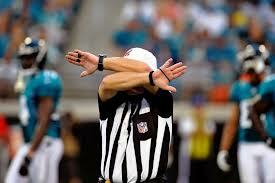 I think it's too early to say what tendencies the replacement refs have. They're too new to have developed tendencies. They've got to be changing their approach to officiating on a weekly basis. It's what everyone does in a new situation - they adjust as they learn. The variance in how a replacement ref calls a game has got to be huge right now. Which makes statistically analyzing these refs with any confidence impossible. Which is basically repeating what the article already says, albeit with different reasoning. IMO, I agree this study would be better served using the LV line as the measuring stick. (that, and of course, any conclusion was reached in the first place) If your'e going to go through the all the trouble, you might as well do it as best you can. So... 1) Staying within the quick-and-dirty for college graduates realm, obviously we all understand the reslts would be best served measuring across the variable with least variance to begin with. Well this is it. No question. The author instead had chosen to use -2.5 for every game. Hey can I have that bookies phone number :) Before the arguments of variable contamination begin, first recall that the the line more or less reflects the full body best guess estimate of public knowledge, and since were discussing the possibility of a sudden -unexpected- spike, you'd have to conclude that public hasn't caught up with this, and therefore the line as well. And, even if the line was impacted slightly by a few high-stakes gambling groups based on no more than a possible theory and a couple dozen games, it would still be better than using -2.5 every game. That said, has anyone got these results? Just look at home team ATS for the first 3 weeks, simple as that to start. I have to say I love your articles, although I get a bit lost when you get into the nitty gritty math stuff. In regard to the familiarity with the surroundings being a factor: Have you any data about how HFA affects team that share the same stadium? In italian football (the proper kind from a European perspective) both Lazio and Roma, and Inter Milan and AC Milan share stadiums, and in the NFL Jets and Giants share one. In those cases the only difference would be which club has control of the ticket sales and therefor the crowd. I guess there might be a problem with getting a large enough sample from Jets-Giants games as they don't play each other very often and the fact that up until they moved to Metlife it still might have felt as the Giants home field, but it would be interesting to know how sharing a stadium affects the HFA.